Today marks the eighth year that NO Ford/Cosworth, Honda, Mercedes or Toyota 2.65-liter V-8 Turbocharged 'lumps bolted to the backsides of Eagle's, Lola's, Penske's, Reynard's or Swift's will be heard snarling in anger before the green flag waved at Portland International Raceway... Which for nearly a quarter century hosted its annual Fathers Day IndyCar race, sanctioned first by Championship Auto Racing Teams (CART) and followed by the Champ Car World Series (CCWS) from 1984 to 2007, along with having celebrated its Centennial over two months prior to Mother Speedway's first automobile races 'Wayback in 'Nineteen-oh-Nine. Being a native Warshintonion', naturally I take exception to thee OLD-est IndyCar Blogger Geo. Phillips comments towards revered local musician Jimi Hendrix and his rendition of the national anthem which was mentioned in his Random Thoughts on Toronto, for which I failed to watch last Sunday. As George wasn't impressed by the Trues' versions of both national anthems. But C'mon George: Aren't You Experienced? As Hendrix's version of the Star Spangled Banner at Woodstock in 1969 was his take upon the state of our nation in the midst of the Vietnam War - and surely Y'all must be nightly impressed by the "Southpaw" guitar player playing his right handed Fender upside down so eloquently! Meanwhile, is it just Mwah? As am I the only person to notice the "Elephant in the Room" in regards to Indy Cars bout with persistent precipitation! Which stands only behind Honda's underperforming Aerokit's. IndyCar's constant battling of the weather is simply a byproduct of the ridiculously STUPIDLY compressed season schedule all to appease the Pigskin and 'RASSCAR TV audiences! Especially as we here in Seattle are enjoying some most unusually dry months preceding our normal arrival of summer on July 12th! As I'm presuming much of the nation will be focused upon our Postcard perfect weather whilst watching some 'lil 'Ol golf game called the US Open being played at University Place's Chambers Bay facility. 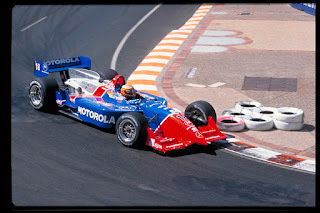 Having attended at least two-thirds of Portland's IndyCar races; not to mention multiple IMSA GTP and SOVREN Historics events - in what was a yearly tradition for "Our Gang," with a minimum of eight Boyz attending the yearly IndyCar outing, especially since the race's date was a known entity: Can you hear me Mark Miles? I'm naturally biased towards PIR and the monumental LOSS of its IndyCar race, being pretty Jaded against IndyCar for its obvious Gaff of giving Portland and the Pacific Northwest a Will Power "Double Byrd" salute! As Seattle was named the fastest growing city in the United States last year, IndyCar's missing a golden marketing opportunity a la the NBA is with NO Basketball Franchise in the Emerald City! As Pierce County, which put twenty million into the Chambers Bay project in the form of Taxpayer Bonds, along with the additional two million plus in initial losses looks overly smart for the entire South Sound region, along with Seattle as reports claim the golf tournament will bring an estimated $148m return from tourist's Greenbacks' being spent upon hotels, restaurants, rental cars, merchandise, etc; Aye Karumba, or should it be FOUR! As Seattle continues to lead the yearly attendance record in Major League Soccer along with having a pretty good professional Football team, having gone to the Super Bowl two years in-a-row! And it just strikes me as plain weird that Seattle or better yet Portland, with a perfectly suitable racetrack already built just not being on IndyCar's calendar. Yeah, I already know the answer... As John Oreovicz has written, Robin Miller has probably reported and Kevin Lee has personally told me on my lone Trackside Blogger Night appearance: If only somebody could step forward with the cheque of a reputable sponsor to pay IndyCar's sanctioning fee, then possibly Portland could once again host IndyCar races in the Pacific Northwest. Whilst I'll harken back to a Teleconference I wasn't privy to - featuring a trio of past Grand Prix of Portland winners, including Mark Blundell in arguably my favourite Hometrack victory!